Do you know a hardworking but unrecognized woman who is positively contributing to society and her community? If you do, nominate her for the 2017 EbonyLife TV Sisterhood Awards, which will take place on Tuesday, November 14th, at 6:30pm, at Eko Hotels and Suites. Nominations will be accepted until Sunday, October 1st. The awards acknowledge significant but mostly unknown accomplishments of women in Nigeria, in categories such as business, arts and entertainment. The event will be hosted in partnership with Women in Management, Business and Public Service (WIMBIZ), as part of their 16th annual conference. 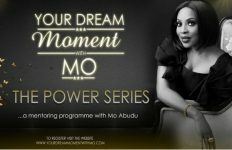 Mo Abudu, founder and CEO of EbonyLife TV, is looking forward to this year’s nominations. “Any woman who has significantly contributed to her community and to the larger society should be nominated. Recognizing women who have excelled empowers others to accomplish great things.,” she said. Aishah Ahmad, chairperson, WIMBIZ Executive Council, is looking forward to the nominations for this year’s Sisterhood Awards. “These awards honour women who have made a mark in their respective sectors, it’s a way of reminding them that their efforts do not go unnoticed,” she said.